...Yip, I'd call that a win - and a pretty damn impressive one at that. 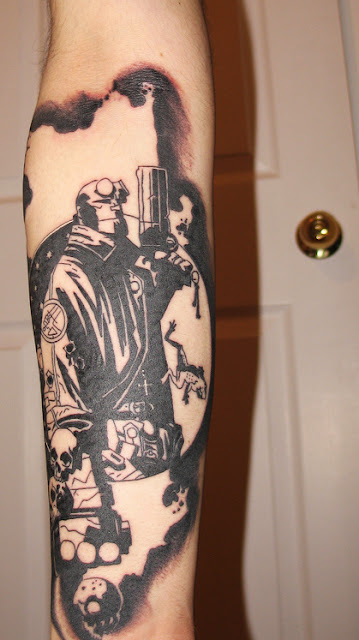 Not to be outdone, here's initial photos of a man dedicating his whole arm to the updated looks of the original line-up from Avengers #1.
the Hellboy piece looks great in single color, but the Avengers would look so much better in color. I've toyed with the idea for years, but like you wanted to make the right choice. It is something you're going to have to live with for a long time. The ones I keep coming back to are the Autobot and Decepticon symbols, one on each shoulder/forearm, whatever. The three avengers tattoos share the same style. Is the Tattooer someone you know? I'd go for that person, when doing mine, whatever the image might be. CDerosby, hope I won't get in trouble with you if I express my opinion (and it's only my little opinion)that there must be a better tattoo than transformers simbols in your arms? I hope you don't get angry, because I love talking with you. I did have a better idea symbolizing my three kids, but we're talking a wrap-around torso piece with wrap-around sleeves down each arm. I'd bleed to death on the table. One of these days I'll draw it up though. I agree Craig Hellboy looks awesome in just black ink! One of my friends has the Autobot face on his arm as his nickname is Jazz and has been since we were in primary school and he loved the Autobot more than was probably healthy at the time. It doesn't look to bad either. The Tattooer isn't some one I know Aliera - though I would be going to them if they were - each one of those Avengers are incredible. If I had to chose three Avengers to go on my arm I think I'd run with Hawkeye, Scarlet Witch and Vision. But I'm to much of a wuss for that kind of punishment so I might have to look for option b.